So, time for the weekend round-up. Friday evening, after spending the day very dopey, Loulou & I headed off to our first Blogger Meet. It wasn't terribly exciting and was (I thought) pretty poorly attended. Only knew Chews there, but I guess, at least we knew someone. We didn't stick around longer than a single drink because I wasn't feeling that great but, on the way home we figured we'd stop by Newscafe in 4ways for another drink with Loulou's friend CrazyLady. This turned into a slightly longer stay than expected ... especially since I was drinking water - not taking any chances with the gaping hole in my mouth and the subsequent pain killers and antibiotics. Then we hung around and met up with Wiggly & Phlippy, chatted a while and then headed home for some much needed sleep. I spent the whole of Saturday in bed. I meant to get up and do some admin stuff, like shopping, but I just couldn't bring myself to get up. I woke up feeling like I'd been punched. Thankfully I haven't had any swelling at all tho. Unfortunately my Lost Room dvd was still with Lady & Bug, but they'd copied Lost 3 for me. So that is how I spent my day, watching Lost 3 in bed. Fabulous! Although I only got half way - that's all they copied :( I am now expecting a week of withdrawal with no tv series to watch - sob, what ever will I do? Kidding. Well, a little. Anyway, then it was fondue time. Loulou had organised 2 weeks ago and even so, in a move that I thought was purely Capetonian, 2 people canceled mere hours before the event. But it was still a blast and she'd made magic brownies which didn't seem to affect any of us. The fondue was fun and was followed by a surprisingly quick game of 30 seconds. Then we were supposed to head off to a house party and meet up with Wiggly & Phlippy but Lou got an sms saying they were on their way home. So Saturday ended pretty early too. Sunday I managed to get myself out of bed before midday - yay for me :) I found myself missing Varen ... it took supreme concentration thru out the day not to sms him. This is annoying because it means that all the anger at him for how he's handled things seems to be dissipating far sooner than I'd prefer. I want to be angry with him, I'm still hurt. But now I miss him too. Which is annoying. Because it doesn't make a difference. It never mattered how much I liked him, because it'd never have been enough for him. Sad, huh? So, I had a bit of a sad day on Sunday and so sequestered myself in a dark room where no one should be allowed to speak with all sorts of escapism playing out in front of me: the movies. Loulou joined me for Pirates of the Caribbean: At Worlds End. 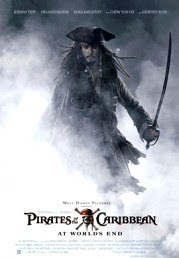 As the age of piracy comes to a close, Captain Jack Sparrow, Will Turner and Elizabeth Swann must sail off the edge of the map, navigate treachery and betrayal, and make their final alliances for one last decisive battle. Our heroes must face Lord Cutler Beckett, Davy Jones and Admiral James Norrington in a titanic showdown that could eliminate the freedom-loving pirates from the seven seas – forever. And then we headed home and I debated what to do for the rest of the afternoon as it was only just after 3pm. I thought another movie was called for. So I headed off to Monte Casino to watch The Number 23 - even after JofH had warned me against it. First it takes hold of your mind...then it takes hold of your life. 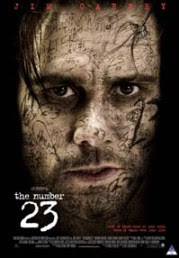 The psychological thriller The Number 23 stars Jim Carrey as a man whose life unravels after he comes into contact with an obscure book titled The Number 23. As he reads the book, he becomes increasingly convinced that it is based on his own life. His obsession with the number 23 starts to consume him, and he begins to realize the book forecasts far graver consequences for his life than he could have ever imagined. It was pretty interesting, a new concept. I kinda liked it, but it wasn't earth-shattering. An unusually un-funny role for Jim Carrey. And that was the weekend, it was pretty okay till my sad Sunday mood arrived. And it doesn't seem to have left either. Is it normal to think that it's too late to be loved, or to love again? That's how I feel. I know everyone keeps saying that 27 is not old ... but it feels like it is. Like it's too late. Like I've missed my chance, like I gave up. I feel like I have too much baggage ... like I am burdened by experience. I was trying to remember this weekend when I was last really happy. Like for more than a fleeting moment. When last I really laughed, more than just a giggle at a passing comment. I couldn't remember the answer for either. I realised that I'm not really happy at the moment. I don't know how to fix this ... ? Sometimes I love being alone, being away from anyone else because it's easier and safer. The rest of the time I wish I had someone to do things with, even if it means just being in their quiet company ... but not alone. You know? This is a complicated time, emotionally. As you can see from the state of my weekend, it was not a problem :) Hope you feel better tho! Hey I thought Kiera Knightly was oh so scrump-diddly-umptious! But ja, a tad annoying too. @wiggly - you're *such* a boy ;) I know there are only a rare few who would dare say NO to Keira.